Understated elegance. That is when you know ya got “it”. Some people scream it at the top of their lungs. Some people promote their swag loudly. Others, however, just do. No showboating. No “look at me!!!”. No over-the-top displays. Just action. With the REV’IT! Naples Jacket, that is exactly the kind of mentality that is featured throughout. 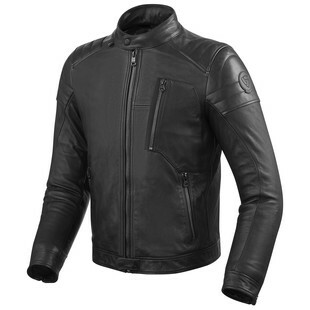 Minimally branded and as streamlined as the Batmobile after a fresh polish, the Naples Jacket makes use of premium drum dyed semi aniline cowhide that has been specially finished with various waxes before tumble-drying to perfection. This process leaves the Naples Jacket with a unique aesthetic and supple feel. Asymmetrical in its aesthetic, the REV’IT! Naples Jacket also stands out in that it provides an attitude all its own to go along with a resounding moto-aptitude in its features. Additional aspects of the Naples Jacket include SEESMART CE Level 1 protection at the shoulders and elbows, a detachable thermal liner, and safety stitching for additional slide protection. Keeping it low-key doesn’t have to mean keeping it low-fashion. Timeless in its design and contemporary in its construction, the REV’IT! Naples Jacket spans the gap of generations of motorcyclists, and will continue to provide riders with equal aptitude for years to come.